Tap here to get the TI-Nspire CAS iPad app on the App Store. After a hiccup with the initial launch, the TI-Nspire iPad app has been available on the App Store for a couple of weeks now. I’ve been playing around with it since it was released. There’s no doubt about it, this is a terrific first release. If you are already a TI-Nspire enthusiast and want the convenience of having the Nspire on your iPad, you need to read on because you’re going to have to give this app serious consideration. Users of TI-Nspire handhelds such as the CX will feel right at home on the TI-Nspire iPad App. However, it’ll feel even more familiar if you are a user of the TI-Nspire computer software since the app maintains the software’s look, with the active window on the right and all other windows within the document in miniature on the left. Almost the entire suite of TI-Nspire applications is here, including calculator, graphs, geometry, spreadsheets, and statistics. Nothing is missing but the Vernier DataQuest, which is simply gone due to the inability of the iPad to interface with Vernier’s data collection hardware. This collection of applications automatically moves the Nspire app to the top of the list in terms of what’s available in the App Store. While I’ve seen some really nice apps that do graphing well or geometry well, I haven’t seen anything that could do everything the new Nspire app can. While the menu system is very similar to Nspire handhelds and computer software, you’ll no doubt find that it still takes a little getting used to if you are a longtime TI-Nspire user. A wrench symbol brings up a menu, a keyboard replaces the keypad, and the control button used to access additional features on the handheld has been replaced with long pressing buttons. Fortunately, the TI programming team really did a great job tapping into the tools Apple has made available to its developers in iOS. Apple could learn something from the small directional arrows TI included on the keyboard for this app which are a lifesaver when you are trying to back the cursor up a space or two. Give it a couple of days, and you’ll find that it’s really easy to adapt to this new user interface. I loved the look and interface of the Nspire app’s keyboard. The most exciting thing about seeing the TI-Nspire in iOS is the ability to use touch features. While the touch screen is a cool thing to have throughout the Nspire app, it really shines in the graphing and dynamic geometry applications. When graphing, you can use pinch to zoom on the screen and can trace the graph with your finger to find points of interest such as intercepts and extrema. In the dynamic geometry window, I love the ability to manipulate the geometric figures on the screen with my finger. This really gives you a feeling of control that isn’t quite there with the handheld version of the TI-Nspire. Users will feel a great degree of control with dynamic geometry. 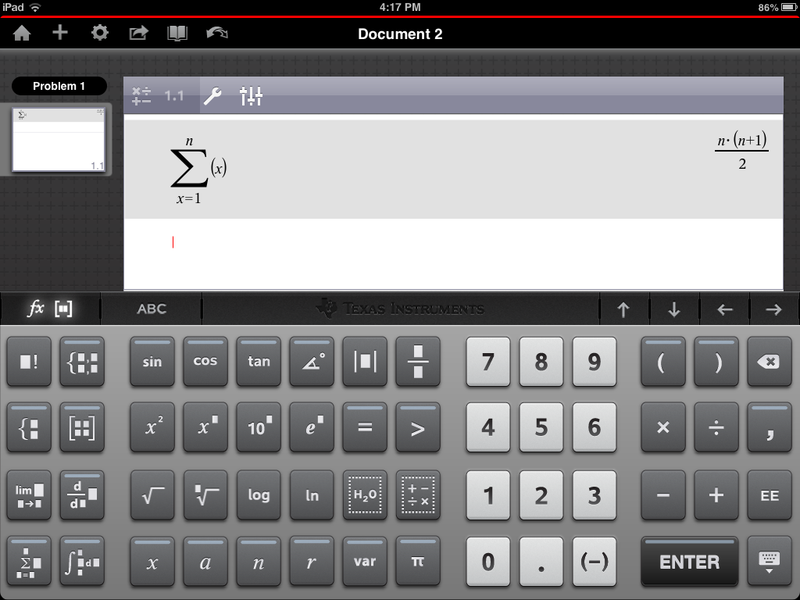 In addition to bringing the functionality of the TI-Nspire handheld to the iPad app, Texas Instruments developers added a couple of sweet features that are specific to the iPad version of the TI-Nspire. 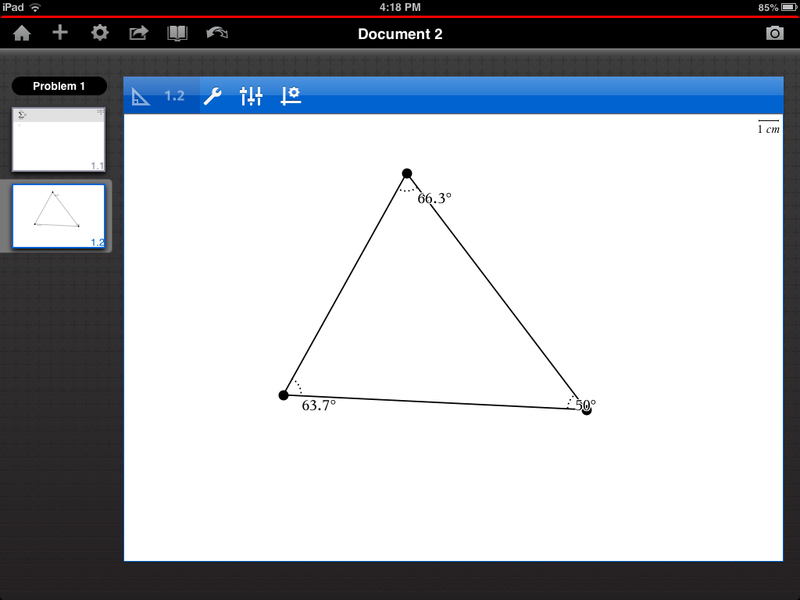 First, you can take pictures from right in the app and insert them into your document for graphing purposes. While the handheld and computer software versions of the Nspire have the ability to graph on pictures, they have to be taken on a camera and then imported into the software. 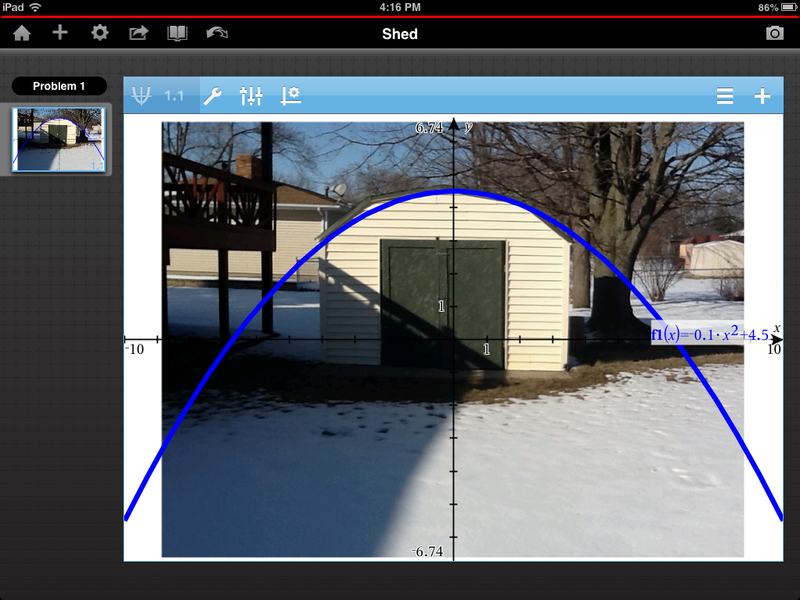 On the iPad app, it’s as simple as pressing the camera icon while in a graph. The camera opens up and whatever picture you take is instantly loaded onto your graph screen. The other feature that really caught my attention was the ability to integrate with cloud file storage services. Specifically, the Nspire app will allow you to link your Dropbox account and open any Nspire files you’ve stored in Dropbox without ever leaving the app. I use Google Drive as my cloud storage solution, so I couldn’t load my files from within the app. However, I can verify that when I went into the Google Drive app and selected a TI-Nspire file, Google Drive gave me the option to open it with the Nspire App and it opened perfectly. A simple file, but it opened without a hitch from within Google Drive. I haven’t seen an iPad app yet that was perfect in its initial release, and the Nspire iPad is no exception. While I loved the ability to take pictures directly in the app and graph right on them, it did sometimes result in a memory error that crashed the document. A rare reboot of my iPad did seem to help, so I’m not sure if the problem was with my iPad or the app itself. I also found that my work in the dynamic geometry window was slower than I would have liked because if I wanted to draw the same shape multiple times (say, the 3 segments of a triangle), I had to select “segment” from the menu each time. On the handheld and computer software, you don’t have to keep re-selecting from the menu if you are creating the same shape multiple times. Also, if you’re a person that likes to use portrait mode, that’s not currently possible with the Nspire app, which is always locked in landscape. None of these minor wrinkles was enough to dampen my enthusiasm for the app, but I do hope they’ll be ironed out in an update to the app at some point. Taking and loading pictures had a few bugs, but was really cool once I got it working. As is the case with entire TI-Nspire family of software and handhelds, there are two version of the TI-Nspire app, CAS and non-CAS. CAS stands for Computer Algebra System, meaning the CAS app can manipulate variables (i.e. it understands that x+x is 2x). Normally, I would make the case that if you’re a student, you need to really consider what tests you’ll be taking down the road because some standardized tests ban CAS calculators. However, you’re not going to be able to take an iPad into a standardized testing situation anyway, so my recommendation is the CAS version. It’s got some really powerful features that the non-CAS lacks, such as the ability to factor, solve systems of non-linear equations, simplify radicals, find integrals symbolically, and many others. The obvious question everyone will be asking about the TI-Nspire App will be, “Is it worth the $30 asking price?” The answer to that question is going to depend on your situation. There’s no doubt that at $30, the TI-Nspire App delivers a ton of value. It is the first iPad app to deliver an educational calculator, spreadsheet, data analysis, and dynamic geometry software all in one. It’s also about $100 cheaper than a standalone TI-Nspire handheld. However, there are some limitations to the real world use of the app. Chiefly, the College Board and ACT won’t allow an iPad app on their exams and aren’t likely to any time soon. And while we may find that high school and college classrooms are becoming more accommodating, the use of internet enabled devices like the iPad is still far from universal acceptance, especially on assessments like tests and quizzes. This means that most students will find that they still need to purchase a handheld device in addition to the app for use on tests. 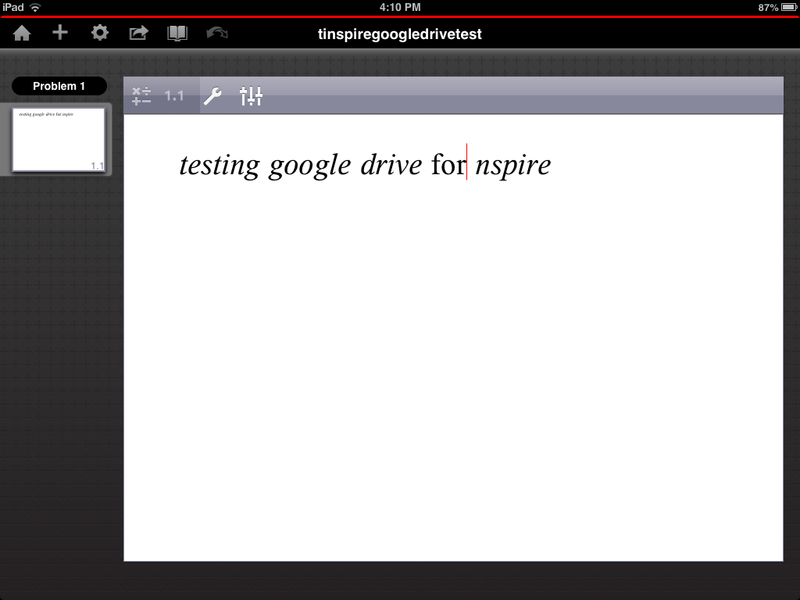 That said, I can easily envision many scenarios where the TI-Nspire iPad app is a great purchase. For one, I can see why teachers would want it. I carry my iPad with me just about everywhere, but even an Nspire enthusiast like me doesn’t always carry my TI-Nspire CX around. I’m already finding how nice it is to have the TI-Nspire with me on my iPad at all times. Texas Instruments seems to be aware of the market for this app with teachers as they are including a license for the TI-Nspire Teacher Software with the app. I can imagine that many college students would feel the same way as teachers will about having the convenience of the Nspire on their iPads. Schools that are already providing iPads to students for a one to one computing solution will find the app a much cheaper way to get the Nspire platform into their students’ hands than purchasing handhelds. I would bet that there are some home schooling parents out there that already have their children working with educational apps for the iPad that will also want to take advantage of this app. It’s also occurred to me that in a family with a couple of kids in school that the app could be a cheaper way to get a second TI-Nspire into the home. Whichever kid has a test on a given day could take the TI-Nspire handheld while the other one works on the app. Bottom line, I can’t tell you if the TI-Nspire app is right for your situation, but I can tell you that it’s a great app that provides a good and fair value at $30. It’s easily the most complete mathematics education app available today for any mobile device. Tap here to get the TI-Nspire CAS iPad app on the App Store.